The Food and Drug Administration has given a green signal to introduce new cholesterol drug-considered to be a breakthrough for lowering the risk of heart disease. The development comes after a gap of 20 years, since any new such medicine was prescribed. The USFDA approved Praluent (alirocumab) injection, the first cholesterol-lowering treatment approved in a new class of drugs known as proprotein convertase subtilisin kexin type 9 (PCSK9) inhibitors. Praluent is approved for use in addition to diet and maximally tolerated statin therapy in adult patients with heterozygous familial hypercholesterolemia (HeFH) or patients with clinical atherosclerotic cardiovascular disease such as heart attacks or strokes, who require additional lowering of LDL cholesterol. HeFH is an inherited condition that causes high levels of low-density lipoprotein (LDL) cholesterol. A high level of LDL cholesterol (known as “bad” cholesterol) in the blood is linked to cardiovascular disease. Heart Disease is the number one cause of death for Americans, both men and women. According to the Centers for Disease Control and Prevention, about 610,000 people die of heart disease in the United States every year– that equals one in every four deaths. 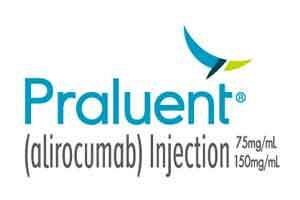 Praluent is an antibody that targets a specific protein, called PCSK9, which works by reducing the number of receptors on the liver that remove LDL cholesterol from the blood. By blocking PCSK9’s ability to work, more receptors are available to get rid of LDL cholesterol from the blood and, as a result, lower LDL cholesterol levels. The efficacy and safety of Praluent were evaluated in five placebo-controlled trials, involving 2,476 participants exposed to Praluent. All participants had HeFH or were otherwise at high risk for heart attack or stroke, and were taking maximally tolerated doses of a statin, with or without other lipid‑modifying therapies. Participants taking Praluent had an average reduction in LDL cholesterol ranging from 36 to 59 percent, compared to placebo. Multiple clinical trials have demonstrated that statins lower the risk of having a heart attack or stroke. A trial evaluating the effect of adding Praluent to statins on reducing cardiovascular risk is ongoing. The most common side effects of Praluent include itching, swelling, pain, or bruising where injection is given, nasopharyngitis, and flu. Allergic reactions, such as hypersensitivity vasculitis (a skin rash usually appearing as purple-colored spots on the skin associated with inflammation of small blood vessels) and hypersensitivity reactions requiring hospitalization, have been reported with the use of Praluent. Patients should stop using Praluent and get medical help if they experience symptoms of a serious allergic reaction. The drug from Sanofi and Regeneron Pharmaceuticals Inc. gives options to the patients to lower their LDL, or bad cholesterol. It comes as a major relief for people who are at a high risk of a heart disease. But questions about the price and long-term benefits of the medication are being raised by the experts. Praluent is the first in an experimental class of biotech medications that use a novel approach to lower bad, or LDL, cholesterol, which can lead to heart attack and stroke. The new drugs are considered the first major advance in the field since the introduction of statin drugs more than 20 years ago.